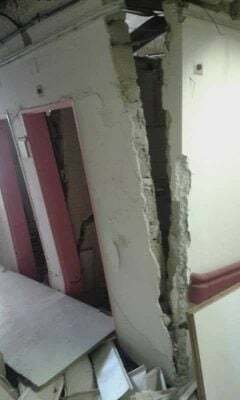 A bomb exploded in a crowded area of Benghazi Medical Centre today which has been busy dealing with the wounded from the army assault on Ganfouda. The device, thought to be in a suitcase, was left in a fifth floor lavatory. Four people were injured in the blast and others were treated for shock, but there were no deaths. The bomb blew the lavatory apart and sent shrapnel and plaster scything down a corridor. The hospital management put out a statement condemning the attack on a vulnerable location where staff were entirely focused on trying to care for the injured. Nevertheless, tighter security was now being put in place at the hospital.